Knorr® Beef Gravy delivers superior quality, balanced meat flavor, and performance you can rely on. Convenient and labor-saving, with easy prep. Deliver simple, clean food with ease. Knorr® Gravies are reinvented by our chefs with your kitchen and your customers in mind. Less of what you don’t want, with the great flavor you do. 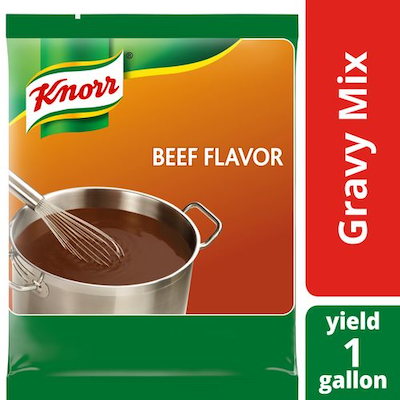 Specially developed for chefs, Knorr Beef Gravy Mix allows you to add classic flavor to your favorite dishes in just minutes. This dry beef gravy mix combines beef stock and select seasoning, creating a rich flavor and aroma that your guests will think was home-made. With its delicious homestyle taste and flawless consistency, this beef gravy powder makes a perfect accompaniment for your favorite meat, poultry, or side dish. The dry beef flavor packets are easy to prepare: simply whisk the gravy mix in water, cook to 165 degrees Fahrenheit (74 degrees Centigrade) for one minute, and serve. This instant gravy mix is gluten- and dairy-free and contains no artificial flavors or preservatives. 1. Gradually whisk contents of package in cold or warm water. 2. Cook in a steam table, stove top or microwave until product reaches a temperature of 165F (74C) for 1 minute. 3. Stir occasionally.